How To Fix A Sick Kid From Miles Away. I don’t know about you, but when they call to say they are sick, the miles between home and school seem even longer. My daughter had the flu during her first semester at FAU. She could barely get out of bed and I checked on her frequently throughout the day. I even offered to drive down if she needed me to. This was not an everyday cold; she sounded miserable and I knew she felt the same. I was even more concerned because she was a few weeks into the semester at FAU. After about a week and visit student health services, she was feeling better. You would be amazed at how quickly a care package can get to them. (UPS is generally overnight from one Florida destination to another.) 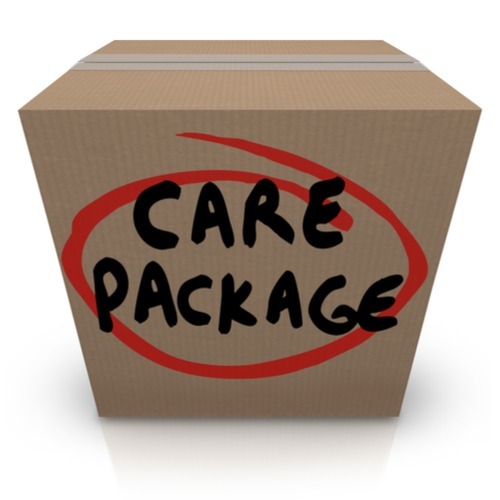 Depending on what is ailing them, even the simplest of care packages filled with soft tissues, lozenges, some Kind bars, Emergen-C, a few fun teas, Sudafed, Clorox wipes, cozy socks and maybe some homemade brownies can feel so good. I always send my daughter back to school with some frozen homemade chicken soup because I know at some point, she will need some. Corner Bakery Café is a favorite among students for their homemade chicken soups, however, you will need to enlist the help of their roommate to pick it up. Nationally, there is also GrandmasChickenSoup.com. They actually have complete meals as well as soup and other goodies. I hear that chicken soup can heal anything. If they are really too weak to shop for themselves there are a number of delivery companies that will bring them what they need too. Check out our blog on delivery companies. There are a few other companies that have pre-made “Get Well” baskets and packages as well. Etsy has some great get well soon care packages with lip balms, candles and herbal rubs, teas and more). A fresh pair of sweatpants or pajamas can feel pretty nice if they are spending a fair amount of time in bed. Many companies, like Macy’s or Nordstrom, will rush an order for a fee. Gap makes these pajamas called print joggers made from a soft, lightweight modal jersey knit. My daughters love them because they are super soft, comfortable and when they are not feeling well, that is usually what I find them wearing- they “borrowed” mine and well, let’s just say, I never saw them again. Make sure you search using the print joggers in modal. Locally there is Just Baked, which should also do the trick when a sweet treat is just what the doctor ordered. Nothing cheers any college student up more than a handwritten letter from home so no matter what you send, put one of those in there too.